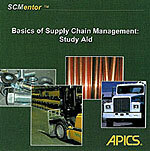 Developed in 2003, this CD-based self-study aid assists the user with preparation for the for APICS CPIM “Basics of Supply Chain Management” certification exam. For non-certification-oriented learners, the study aid is an efficient introduction to key materials and production management concepts. In 19 learning units, explanations and animated demonstrations cover a range of topics including EOQ, Master Scheduling, BOMs, Moving Average Forecasting, MRP, Inventory Turns etc. Diagnostic problem solving tests with detailed answers are valuable content to reinforce key concept requirements. Walk through demonstrations of how to solve problems similar to those in the Basics of Supply Chain Management Participant Guide. Tackle problems that test your comprehension of what you learn in the demonstrations, and then receive immediate feedback on your approach to solving them. Take a diagnostic exam to see how well you understand key concepts. Note, this item was created when the BSCM Participant Guide was at release 2.1 – it is still very useful to assist with APICS study, however there are some topics which were introduced in release 3.x of the Participant Guide which are not included within this CD (e.g. Drum-Buffer-Rope, Six Sigma, Exponential Smoothing). The CD, created by USA based “SCMentor”, includes a passcode for access.